Sustainability in the built environment is a major issue facing policy-makers, planners, developers and designers in the UK, Europe and worldwide. The measuring of buildings and cities for sustainability becomes increasingly important as pressure for green, sustainable development translates into policy and legislation. The problems of such measurement and evaluation are presented by the authors in contributions which move from the general to the particular, e.g. from a general framework for an environmentally sustainable form of urban development to a specific input-output model application to environmental problems. 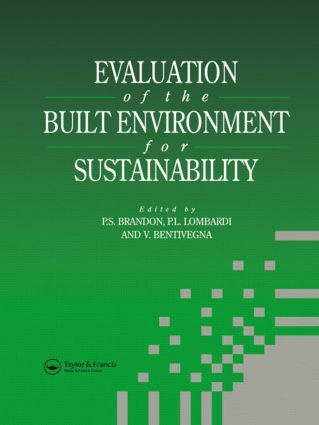 The book is divided into three parts: the first covers city models and sustainable systems - research programmes, environmental policies, green corporations and collaborative strategies to make urban development more sustainable; part two discusses the problems of evaluating the built environment in planning and construction, covering economic and environmental methods and construction, development and regeneration processes; part three illustrates a number of applications using different approaches and techniques and referring to a range of environmental aspects of the natural and built environment, from maintaining historic buildings to transport management and air pollution monitoring. Environmental assessment methods for use at the building and city scales: constructing bridges or identifying common ground?